It is absolutely tragic when a person takes his or her own life. The news out of Kansas City regarding the Chiefs’ linebacker killing his girlfriend and ultimately himself is heart breaking. However, the Chiefs and the Panthers went on with their scheduled game on Sunday and the team and affected family and friends went about the task of making sense out of the tragedy. Then a sports announcer used his commentating platform to decry the dangers of gun ownership. The point was made that if there was no gun available then both people would still be alive. Now, whether or not that is true or even the “guns don’t kill people; people kill people,” argument, one thing is absolutely clear: As people, we will always attempt to shift any sort of blame for wrongdoing away from us. In other words, we avoid taking responsibility for our lives like the plague. Often, the only responsibility we take is blaming others for our own bad behavior. We seem to live in a world of victims. When something negative happens to me it is someone else’s fault. When I make a decision to hurt someone else, it must be because of the way I was raised or the city in which I was born or some other factor that I could not control. I am a victim of my circumstances and environment and I just can’t help but act the way I do. In one breath, Adam blamed the “woman” and then blamed God (the woman YOU put here with me). Then Eve follows Adam’s lead and blames the serpent. It’s always someone else’s fault. It has been from the beginning. Or at least that’s the easy thing for us to say. But what if we actually stopped to consider our part in all of this? What if we began to take responsibility for our own actions? If I sit down at the table and eat and eat and eat and gain an unhealthy amount of weight and die at an early age due to heart disease, I cannot blame the chef who cooked the food. It was my fault. If I cut someone off in traffic and he pulls by me and communicates his disgust towards me in some form of non-verbal sign language (I don’t think that means, “I’m number one.”), I cannot blame the car manufacturer who built the car. It was my fault. I didn’t look. Gun control issues aside, a gun was used to kill a girl in Kansas City by a man who made a choice. Jesus said murder comes from the heart. If not a gun it would have been some other weapon. The bottom line is that a man made a decision. It was his decision. He is responsible. As much as we “amen” to that last statement, so also are we responsible for all of our actions, thoughts, decisions and deeds. 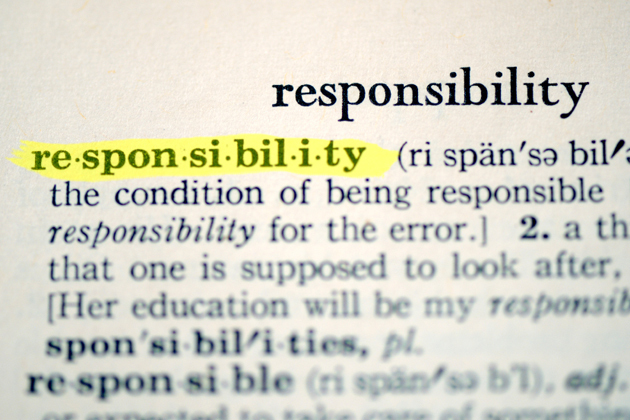 Take responsibility for your life. Recognize when you make a mistake and own up to it. Realize that you chose to say those words and then apologize for it. Acknowledge that you are a sinner in need of a Savior and admit it to God. It’s the first step toward restoration and it is worth it in the end.